This donation DISGUSTS me ! Honoring someone that has MURDERED a Law Enforcement officer is about as LOW as Colin Kaepernick can get ! What does one expect from a communist like Kaepernick, who worships Castro the communist, Che Guevara, who was an avowed Marxist and killed innocent people by firing squad, and his cops are pigs socks. Like I stated in previous columns, let Kaepernick move to Cuba, where he will have a one room apartment with no air conditioning, Kaepernick will have a filthy hospital to go, to, since he admires Castro’s National Health Care and he will lose his freedom of speech, under communism. Kaepernick can take the thugs in the NFL, who will not stand for our National Anthem, to Cuba with him. These thug trash amoeba brains will regret the day, they left the United States. Apparently Kaepernick is trying to enhance his liberal…communist…socialist Democrat resume. He’s probably planning a Senate run. Maybe McCain has taken him under his wing. I think he needs a Colinoscopy with a big drill bit. I agree the NFL has Lowered the Bar for head cases like him. + that nut bag girlfriend. There is the real problem. krapperdick is too stupid to have orchestrated this himself, but his muslim girlfriend isn’t. You will notice that he didn’t develop any of this anti America bullspit until he became involved with her. Put them both on a leaky boat and shove it toward cuba. How can this NOT BE SEEN as supporting a criminal, or terror group?? Didn’t think “K” could get any lower………. this just proves… YES HE CAN….. Disgusting…….. He better save his money. He sure won’t b getting anymore of ours. Kapernick lowes the bar and his reputation. … and he wonders why he is thought of as a low life? … and he wonders why he is not being “picked up”? .. Appreciation for the country that allows him to give his money as he chooses. He was adopted and raised in a white family. Makes you wonder what happened. Guess he decided to follow in his heroes footsteps. What a loser. And it makes you wonder… IF THOSE white “parents” knew what this turnip would mutate into in his adult life, WOULD THEY have spent so much time, effort and money to have adopted and raised him? This whole thing is too well-orchestrated to be an accident. Kaeperinck is a Muslim convert, married to a Muslim woman with a reputation for being radical. My question it who is behind this? I smell CAIR, Obama and Jarrett. Behind those puppets are Soros and his little Alinskyite darling, Hillary. The MO of Islamists and Communists is the same: to destroy the existing culture so it can be replaced with their satanic agenda. In attacking the national anthem, they are attacking the symbol of America’s ideals. By using the NFL, they are attacking middle class manhood. It’s no different from ISIS/al Qaeda destroying historic artifacts in the Middle East. They are attacking our history, our cultural symbols, our ethnic identity, our conventional morality and even our perception of reality (how many genders??? WTH!). Withholding all financial support from these anti-American initiatives, including taxes that support the warped agendas in our public schools, is what must happen in addition to public protest at all political/bureaucratic meetings in our communities. The only thing his ilk renders unto god is a big middle finger! I think you answered your own question, empd. Who’s behind all these orchestrated attacks? Satan. He’s using his favorite hand puppets (Hillary, Soros, etc.) to handle the details, but this is all clearly a coordinated series of attacks, led by Satan. He’s trying to overthrow America so his well-favored Antichrist can take over the world for the next 7 years. America is not mentioned in the Book of Revelation. Something *really* bad happened to it. And since it’s glaringly obvious that the Rapture is coming up fast, Satan wants to get rid of America now. The real enemy is Satan. The real answer is Jesus. Tick Tock. You don’t have the luxury of a few more years to ponder it. Today is the day of salvation. Don’t wait for it to be too late. You are exactly right empd. krapperdick doesn’t have the mental capacity to come up with this elaborate communist plan. His muslim girlfriend is leading him around by his “little” head, and the rest are just taking advantage of his stupidity. So Assata Shakur = Joanne Chesimard? I know that now. I remember vividly the NJ TPK crime, leaving an officer dead. Given refuge in Cuba, I often wondered why she was still alive…or even if she was. Knowing the history of this horrible story, it is beyond belief that anyone would consider that murderer a hero. And to make a foundation for this felon, obtain contributions and carry on as if nothing bad happened? Folk hero? NEVER. This is just awful, seeing these young people taking the blood money and learning from the very people who support this fugitive- very bad lessons. just so bad in so many way, I have no words. And these dimwits, WONDER why we consider him and his ilk scumbags.. Frankly anyone that supports a convicted cop killer should spend some time in prison! If you support a cop killer, what would stop that person from killing a cop themselves? Kap is a coward, he couldn’t do it himself, BUT he wouldn’t hesitate to urge someone else to do it…. This absolutely DOES NOT make Kaepernick a better human being. He will be a jerk and act stupid all his life. IMO not even death would make him a better human being..
That’s sick! As in; insane! The polarization of America is clearly in evidence here in this column. This is the legacy of barak obama – working for 8 years to foment hate among groups of Americans for each other. The blacks readily picked up on the charge and are running full speed ahead, pausing only momentarily to kneel in protest. Yes, obama reignited race relations into this inferno… That’s his lasting legacy. Low-life vermin. Despicable insanity. 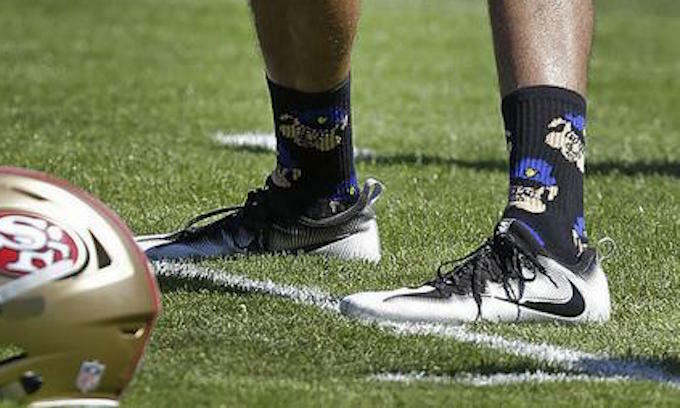 Following the example of their namesake who wore socks with pigs in police uniforms being shot. There are numerous groups working to reduce the black on black violence and murder rate in an inner city of America. The Kaepernick Foundation could have given them money. But no…. Black babies are being murdered in abortion in a great percentage that all other races. Dr. Alveda King calls it “genocide.” The Kaepernick Foundation could have given Crisis Pregnancy Centers money to help save the lives of children whose body parts are being sold. But no…. He is free to donate his money to whomever he wants. However, if he really wants to help young people in the black community he’d find a more worthy cause. Or, he would adopt (either legally or just through action) a few young at risk black children and provide for them so that they won’t go down a bad path. That, however, would require work and not just grandstanding. Praire.. Can i donate to the KKK without it being seen as a hate crime? Can i donate to ISI or some other terror org without getting arrested? WHY? Cause they are all criminal groups. AND IMO Supporting a group that HONORS an AVOWED COP KILLER and someone who still to this day, has never apoligized or done ONE LICK OF penance, should be considered the same thing. His adoptive parents should RUE their decision, he’s made a mockery of them. Hell, his birth mom should rue the day she gave birth to this sicko..
Gee I wonder who the backers are of this Foundation? This *** and all his minions need jail time! More proof he like BLM is nothing but a WORTHLESS TERRORIST and TRAITOR. He deserves a long drop with a short rope around his neck as do all these other TERRORISTS and TRAITORS the FOOLS who support him and BLM or any other lawless group and YES the worst of the Bunch the members of the ACLU who only help the worst criminals in the Nation. Kaep hates whites, like obama hates whites. Imagine that. After “whitey” raised them and took care of them after their “baby daddy” dumped them on “whitey” and abandoned their “baby mommas”, they be pissed. He is only exposing himself more and more as the Liberal piece of garbage he is. And in the process is seriously damaging the radical left. The Democraps are in trouble. You’ve heard the arguments offered by lawyers and various spokesmen affiliated with the NFL, the major media, and the usual suspects, (cynical, pandering, opportunistic politicians), that the “protests” have nothing to do with disrespecting the flag, the military, law enforcement, etc., etc., while offering rather vague descriptions of just what said protests are against, while, from the instigator of the “take a knee” campaign, Kaepernick, further exposes the lie by openly praising and supporting racism and murder. Sooner or later, the dawning will come, and at least some of the participants, acting with mob mentality and likely not even knowing what it’s really about, will regret their herd-like actions. This *** cop hater somehow thinks he’s being a patriotic American. What a joke he is! I put him right up there with Michael Moore and Stephen Colbert. Opportunists looking to cash-in on the left’s current anti-American movement. I’m sure their mommies are proud of the trash they brought into this world. For them I would have made an exception for my disapproval of abortions. How can anyone take seriously a man who criticizes his own country, yet has never even bothered to register to vote?